Granola bars are definitely a staple snack in this house. Clif Bars, Kind Bars, and Fiberful Oats & PB Bars are always on the weekly Trader Joe's grocery list. They are so easy to throw in my bag for an on-the-go snack, perfect for a quick breakfast or an afternoon treat to hold us over till dinner. Andy loves them. The twins love them. And I love them. Win. Win.... Win. Apparently, I didn't toss enough in the cart last week because we ran out! 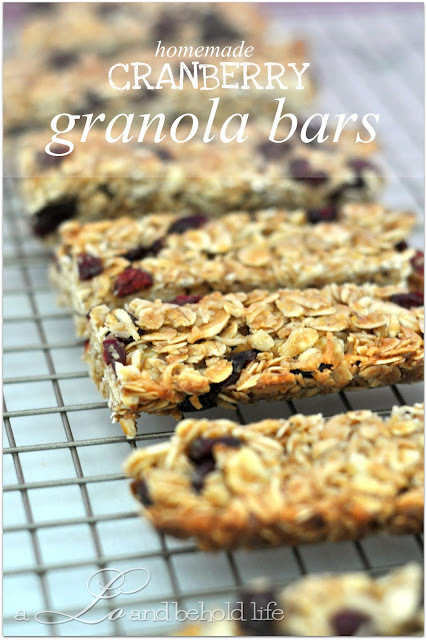 There's no better time than the present to try my hand at some homemade granola bars! Almost everything was already in the pantry for The Barefoot Contessa's recipe - everything but the dried apricots and dates. FYI, I'm obsessed with this Coconut Oil Spray from TJ's. I've officially replaced PAM with it. The bars were perfectly sweet with just dried cranberries. But maybe next time, a little drizzle of melted dark chocolate over the top will turn up the volume on these tasty treats. This lady needs her daily chocolate intake. Yes, it's probably easier to simply go buy a box of granola bars but there's just something about making something from scratch and knowing all the ingredients that go into your food that makes it that much more... well, special. Defs making these gems again. They look delish! Can't wait to try out the recipe!